Determining if your baby has eczema may not be so straight forward. Being a first time mom, I remembered reading a checklist from the paediatrician on what is normal and not normal in a newborn. Rashes is one of the items listed as normal, no need to see a paediatrician. 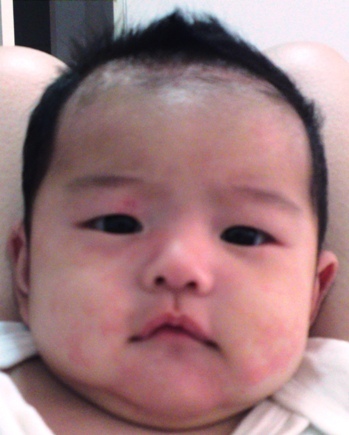 My baby Marcie has eczema from 2 weeks old and I only realised that her rashes were not ‘normal’ on her 1st month checkup. The paediatrician diagnosed Marcie with eczema after looking at her rashes and linked it as an allergy to milk (which turned out to be not the cause). 2. Inflammation – Damage to skin cells caused by scratching. The redness in skin is caused by increased blood flow and the skin feels warm to touch and swollen. There are more signs and symptoms listed in the book “Eczema Free for Life” by Adnan Nasir, but listing all that here will be information overkill.